Tùlach Àrd! 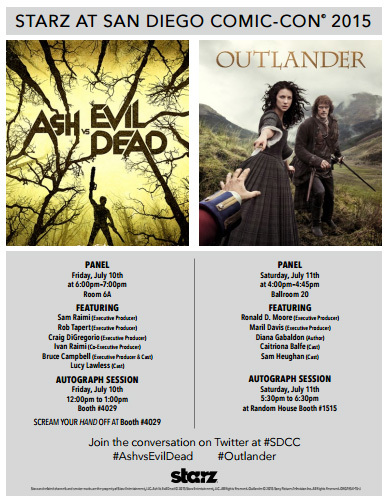 ‘Outlander’ Returns to San Diego Comic Con 2015! Official word came from Starz today that Outlander will again have a presence at San Diego Comic Con (SDCC) 2015. The panel will be on Saturday, July 11 in Ballroom 20 at 4-4:45 PM. Scheduled to appear at the panel are author Diana Gabaldon, showrunner Ronald D. Moore, and actors Sam Heughan (Jamie) and Caitriona Balfe (Claire). E! Online’s Kristin dos Santos will be moderating the panel. Ballroom 20 is the second largest panel location at SDCC, second to only the massive Hall H. Ballroom 20 can hold close to 5000 people. We are hoping that Lotte Verbeek (Geillis) might be able to make an appearance since her film, The Last Witch Hunter, will be in Hall H on Thursday. We also tweeted a request to Starz to include co-executive producer Maril Davis on the panel since she interacts so much with the fans on Twitter. 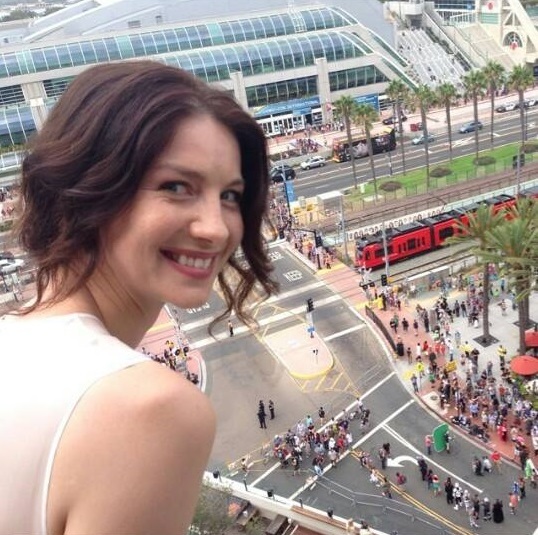 And by the way @Outlander_Starz, we fans do want @TallShipProds on the #Outlander #SDCC panel. Please and thank you! Please RT! Starz will also be having a panel for their new show, Ash vs Evil Dead, on Friday, July 10 in Room 6A at 6-7 PM. We will update this post if any information or panel guests change. UPDATE (6/27/2015): Sam Heughan will be appearing in a panel on Friday, July 10th. He will be a part of “Entertainment Weekly: Brave New Warriors” panel which will be at 4 PM in Hall H.
Several of today’s male heroes, including Zachary Levi (Heroes Reborn), Jordan Gavaris (Orphan Black), Sam Heughan (Outlander), Kevin Durand (The Strain) and Michael Cudlitz (The Walking Dead) who will discuss the thrills and fears of taking on iconic characters, reveal how they broke into the business, and share their favorite stories from set. Moderated by Lynette Rice. Unfortunately, it looks like you will have to camp out overnight if you want to get into Hall H that day to see Sam. Game of Thrones, The Walking Dead, Fear the Walking Dead, and Star Wars all have their panels that day in Hall H. I have tried and failed to get into Hall H on the GoT and Walking Dead day, only to sit in line for seven hours and make it in after both those panels were done. Considering Star Wars is right after Sam’s panel . . . . well, good luck, and keep us posted if you make it in the hall that day. UPDATE #2 (6/29/2015): Co-executive producer Maril Davis is now officially part of the panel. Based on this flyer, I believe that Ash vs Evil Dead will be the big feature at the Starz booth this year. Last year, it was all about Outlander, and in 2013, it was about Black Sails. The Ash vs Evil Dead autograph session is at that booth with the tagline “Scream Your Head Off at Booth #4029. #4029 is indeed the Starz booth according the floor map. Hopefully they might have some promo items for Outlander. This entry was posted in Caitriona Balfe, Diana Gabaldon, Events, Maril Davis, Ronald D. Moore, Sam Heughan, SDCC and tagged Caitriona Balfe, Diana Gabaldon, Maril Davis, Ronald D. Moore, Sam Heughan, SDCC by Sarah Ksiazek. Bookmark the permalink.